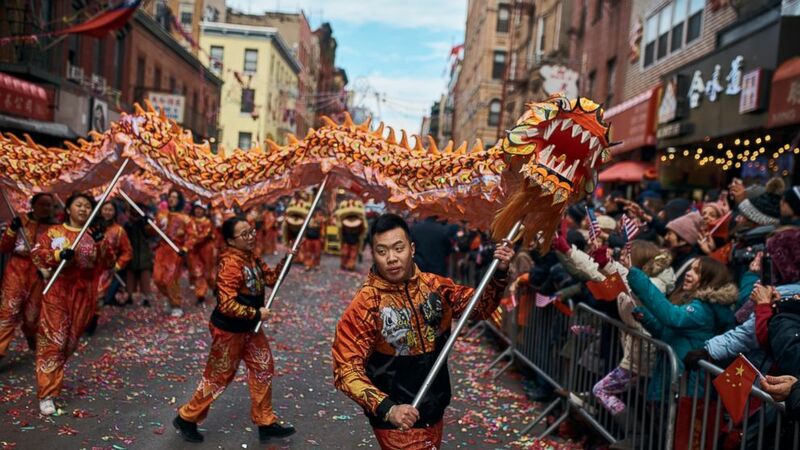 Drums, dragons and dancers paraded through New York's Chinatown on Sunday to usher in the Year of the Pig in the metropolis with the biggest population of Chinese descent of any city outside Asia. "The pig year is one of my favorite years, because it means lucky — everybody likes lucky — and, for me, a relationship or family" and a better life, Eva Zou said as she awaited the marchers. "Because I just moved here several months ago, so it's a big challenge for me, but I feel so happy now." There's an animal associated with every year in the 12-year Chinese astrological cycle, and the Year of the Pig started Feb. 5. Some marchers sported cheerful pink pig masks atop traditional Chinese garb of embroidered silk. Others played drums, banged gongs or held aloft big gold-and-red dragons on sticks, snaking the creatures along the route. Someone in a panda costume marched with a clutch of well-known children's characters, including Winnie the Pooh, Cookie Monster and Snoopy. Mayor Bill de Blasio and U.S. Senate Minority Leader Chuck Schumer of New York, both Democrats, were among the politicians in the lineup, where Chinese music mixed with bagpipers and a police band played "76 Trombones," from the classic musical "The Music Man." "We're here to get good luck for the year," said Luz Que, who came to the parade with her husband, Jonathan Rosa. "Wellness, well-being and happiness," he said.